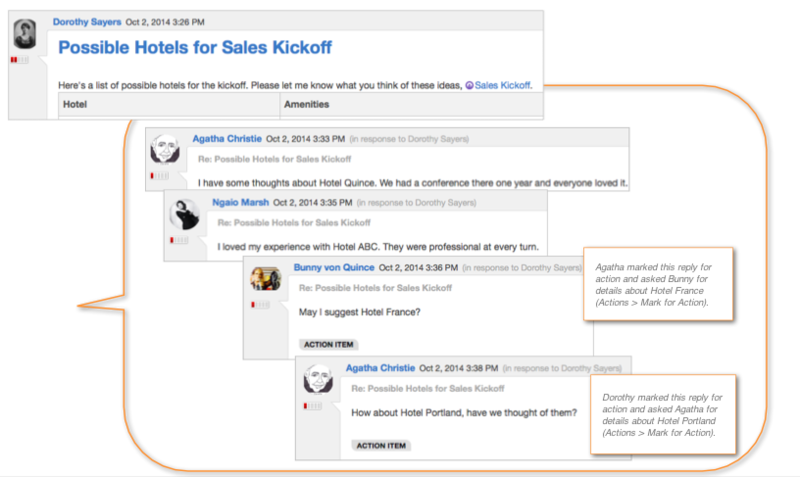 Let's say the VP of sales has just published a discussion called "Possible Hotels for Sales Kickoff." In the post, she has included a list of hotels that are available, their amenities, and the pros and cons of each. 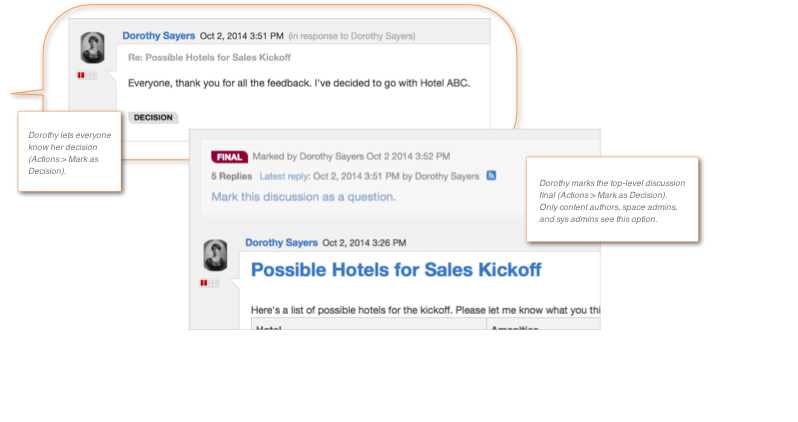 She ends her post by @mentioning the Sales Kickoff group and inviting comments and opinions about the hotels. Over the next few days, over fifty comments are posted to the discussion. Two new hotels are suggested. Different thread participants mark those comments for Action (Actions > Mark for Action) and ask the commenters to provide the hotels' availability, amenities, and pros and cons. Those comments now have Action Item badges on them. You can click the badge to see any notes included with the action item. The receptionist replies that she has dealt with Hotel ABC and highly recommends it. The two new hotels that were suggested are now included in the list, and those actions have been resolved by their owners (Action Item > Resolve). Based on the receptionist's and others' positive comments about Hotel ABC, the VP of sales decides that it's the best hotel for the Sales Kickoff. She adds a final comment to the thread explaining her decision and then marks it as the Decision (Actions > Mark as Decision). Now, the VP marks the entire discussion as Final to let future readers know that the post has been discussed and decided on. At the top of the discussion, the Final badge is now displayed.